What Are The Best Types of Pool Lighting? Home / Backyard Design / What Are The Best Types of Pool Lighting? Want to wow your friends when they come to your next BBQ? Flip on your lights for a fun-filled summer night swim. Lighting can change an average pool into a piece of modern art that is the centerpiece of your garden oasis. Whether submerging the lighting to illuminate the water or setting the ambiance for a photo contest garden look, pool lighting brings out the strongest feature of your outdoor sanctuary. First things first, any pool lighting installation should only be completed by a licensed and trained professional. The market is saturated with a multitude of pool lights to select, but the light’s IP value is the most critical factor in your decision. This value determines the light’s resistance to dirt and liquids. You want a lighting system with a value of 68 for the inside of the pool. That way, your swimmers have a clear view of the water and surrounding walls. You’ll have to have an electrician install your lights so that they’re properly wired from your home to the pool. Installation typically cost less than $200, but if you’re looking for something fancier, it can cost up to $700. Submerged pool lights come in a wide variety of colors and features. While most pool owners have only 1 light color, you do have some options to consider with your installation. 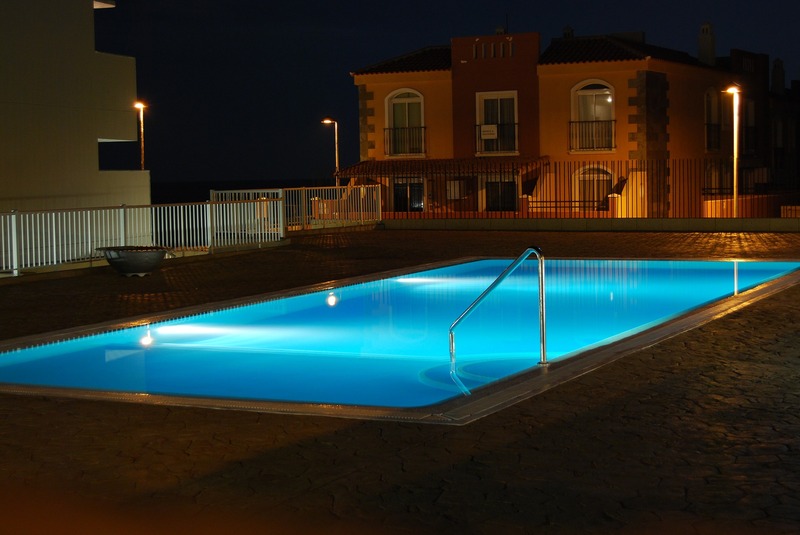 Flush-Mounted Underwater LED Pool Lights – These lights when installed are flush with the pool wall. They are the ideal option to consider when initially constructing a pool because they are easiest to install during construction. Surface-Mounted Underwater LED Pool Lights – While these lights stick out further than the pool wall does, they are a great option for pool lighting after-the-fact. For those pools, which are already completed, installation post construction is possible. Submersible LED Lights – These pool lights do not require any installation and simply sink to the bottom of the pool to illuminate the surface area of the water. For the DIYer trying to save costs and time, in less than a few minutes, your pool is lit up. Can I Light up the Area Around the Pool? Pool Garden Lighting – This lighting can be incorporated into the landscaping around the pool, as well as the pavement. LED Flood Lighting – This is an inexpensive way to bring a yard to life. It is ideal for lighting large areas and can be installed with supplies from a local hardware store. Feature Lighting – Primarily used to highlight accents either inside or outside of the pool (great for waterfalls), the pool light colors can be changed remotely to animate your pool and yard accents. Do I want Halogen or LED Pool Lights? Halogen – These have a very bright torch-like light, which typically can range between $150 and $300. These lights require very little maintenance and typically serviced once a season. In some cases, you will have to replace the ring around the Halogen Pool light every 1 to 2 years. Unfortunately, changing the color of these Halogen lights is costly and quite limiting. Nonetheless, these halogen Pool lights should last 5 to 20 years if taken care of. LED – These have a very bright glow effect and typically cost around $180 to $700. While the initial outlay is greater than halogen Pool lights, LED pool lights only use half of the energy of their halogen counterparts. LED lights cannot be serviced but only replaced. Creatively appealing, they offer over 20 colors that can be changed at a moment’s notice by an app or remote control. The lifespan of most Pool LED lights should surpass 10 years. Your pool itself is enough to wow your friends and family when they visit, but with some nice, pretty lights installed, you’ll be able to take it to the next level. When everyone is winding down at night following your perfect BBQ, you can count on your pool lights to create that feeling of tranquility and satisfaction. 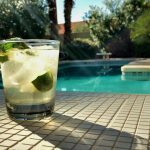 Whether the lighting goes inside or outside of the pool, any of these options would add a significant difference to a yard’s overall atmosphere and the aesthetic of any pool. Are you looking to light up your pool this summer? Let the expert pool contractors at Shoreline Pools service all of your pool-related needs.